The biggest gap between a student's attempt at writing a personal narrative and a fictional narrative is a really strong character. In a personal narrative the challenge of creating a believable main character is a nonissue, of course. You are that character. And whether you show yourself through your writing or not, you are there. You are real. But in a fictional narrative, you have to fill that hole. So not only must you tell a story, but you must do so with a character that your audience can believe in, relate to, connect with. 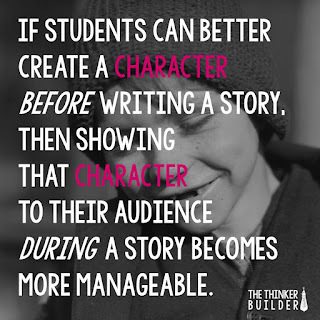 And as teachers, it's very difficult to help students "fix" their character while they write their story. Like putting air in your bicycle tire while you ride to the park. 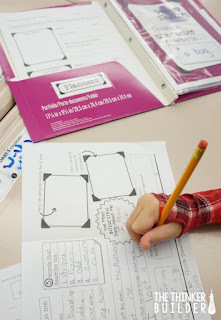 Starting in third grade, Common Core breaks down each of the three "Text Types and Purposes" into several subsections. 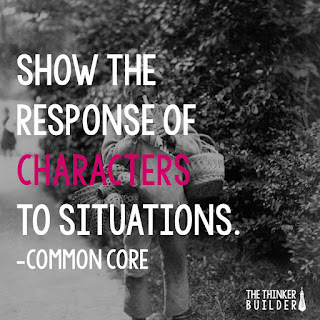 Within the Narrative Writing standard, students must use dialogue and description of actions, thoughts, and feelings... to show the response of characters to situations (CCSS.W.3.3.b) Grade four and five's parallel standards have very similar wording too. Okay, so I'm presenting two challenges here that I think we need to focus more attention on with students: developing a character, and then showing that character. 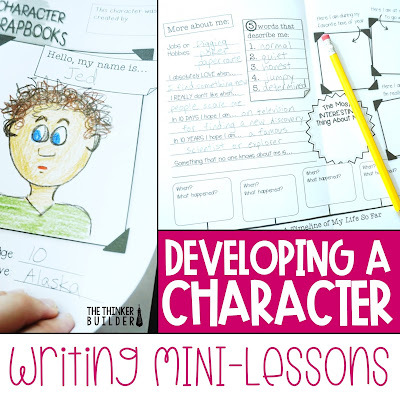 Let's tackle the first one, developing a character, in this post, because if students can better create a character before writing a story--a character with texture, depth, and background, one students know vividly, intimately even (yeah, I said it)--then showing that character to their audience during a story becomes more manageable. Your first task is to break the common misconception that a main character needs to be perfect to be a strong character. Faults and weaknesses are important ingredients in making a character believable. If a student's main character is flawless, it's harder for the reader to relate to her. So you've got to get students to value the bad and the ugly as well as the good. You've got to convince them that a character with a weakness doesn't mean they have a weak character, that these seemingly negative qualities strengthen their character, makes them more realistic, and will almost always add more layers to the conflict in the story. A great way to do this is with a mentor text or two. Call it a "character case study." If you read a novel aloud to your class, analyze the main character within it. If not, try using a picture book by Patricia Polacco or Eve Bunting. My favorite characters to use in this situation are Marty, from Shiloh, Opal, from Because of Winn Dixie, and Despereaux, from The Tale of Despereaux (you really can't go wrong with a Kate DiCamillo book). Discuss with students the chosen character's strengths and weaknesses, likes and dislikes. For example, with Opal: she's loving, she has a soft spot for the unfortunate, she's fair, she's feisty, she's stubborn, she can even be rude at times. Then move outward a bit to the character's home, her family, and her past: Opal lives in a trailer, her mother abandoned her, she has trouble connecting with her father, and she has very few friends (at least at first). Once students realize their favorite book characters aren't perfect, and they buy-in to the idea that those very imperfections are an important factor in why we like those characters so much, you're ready to lay some groundwork. Now that students know their characters shouldn't be perfect, be sure students don't head towards the other end of the spectrum and unintentionally create an evil villain! Together, come to an agreement that, while there is no formula, a strong main character has many strengths and desirable qualities, as well as a few weaknesses, rough spots, or undesirable circumstances. Stress the importance of consistency. If you create a character who loves all living things, be sure you don't have him dumping toilet cleaner into the nearby river. 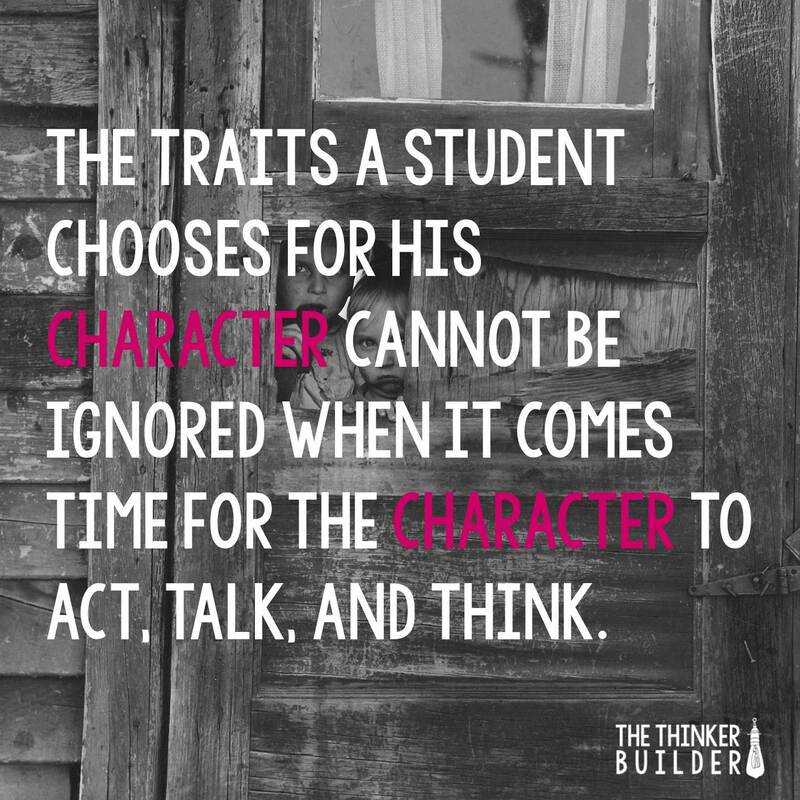 In other words, the traits a student chooses for his character cannot be ignored when it comes time for the character to act, talk, and think. So let's not go off willy-nilly throwing together a million qualities. Let's be sure we choose carefully. 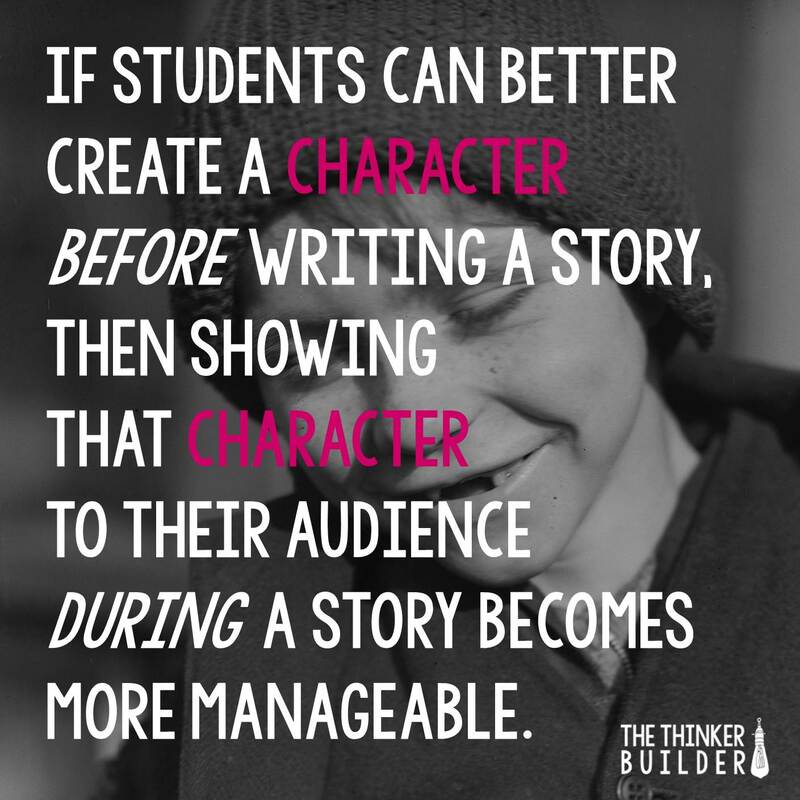 Be sure students understand they are about to build a character, not a story. While there may be story ideas "shaken loose" through the creation of a character and his/her backstory, our main objectives here are to create a character and then get to know that character deeply. Choose two real people you know and mash them together into a brand new person, taking some traits and details about one person and some from the other. For example, maybe you mash-up the drive-thru cashier at McDonald's with the pitcher that struck you out four times last season, or your cousin from the city and your neighbor who walks her dog by your house every afternoon. Think about yourself. Then create a character who is the opposite of you in several ways. Choose a few qualities about yourself, a few interests, a few circumstances. And then flip them. For example, I'm quiet, procrastinating, interested in watching sports and playing golf, and I live in the suburbs. So maybe I make a character who lives downtown, is assertive, organized and on top of things, loves going to the opera, and doesn't even own a television. Imagine you had a friend from your preschool days that moved away, but now that friend is back. What is she like? How does she act? Where did she live? Why did she move? Whether from magazines, some obscure book, or images from the public domain, a photograph of an interesting person can be an inspiring spark for a character. 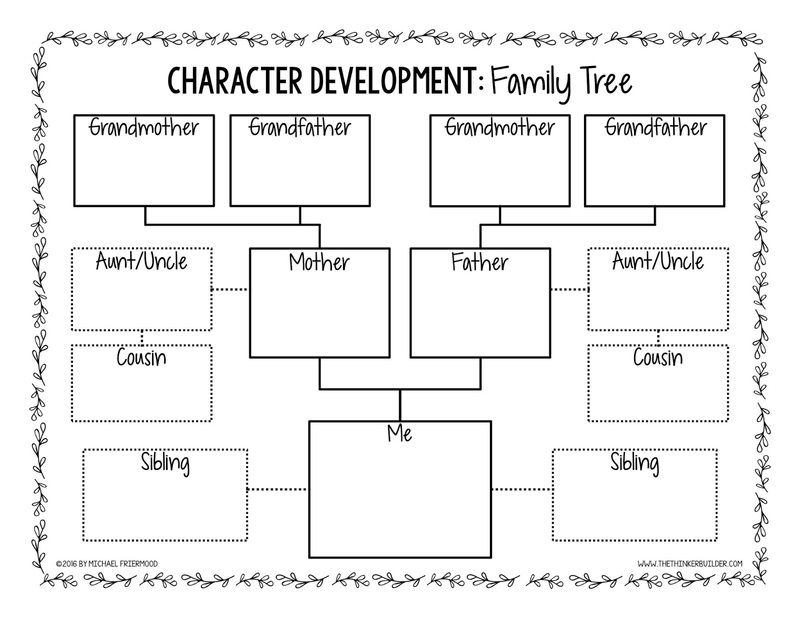 Creating a family tree is a good place to start building a background for a character. 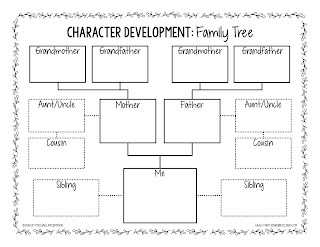 Use this template to add siblings, parents, cousins, aunts, uncles, and grandparents. Give students freedom to cross out and/or add other boxes. A character who has 13 overbearing aunts or a character who is an only child living with a widowed grandfather is rather interesting, after all. Encourage students to briefly describe each person with the type of relationship each one has with the character (strong? annoyed? loving? resentful? jealous? ), and maybe an interesting fact about each one. Another valuable base for developing a character is to draw a map of the character's neighborhood. In what type of setting does the character live? In what type of home? Does he have a backyard? Does he have neighbors? Is it a busy street? What is located up the street? Is there a park nearby? A factory? A railroad track? An ice cream shop? Brainstorm some suggestions with students, since giving them a blank piece of paper can be overwhelming. Have them start in the middle of the paper with their character's home, be it a house, apartment, heck, even a cardboard box would be fascinating. Then have them slowly build out from there. Tell them to be on the look out for story ideas hiding around the neighborhood too! Brainstorm a list with students of important events they would put on a timeline of themselves. Record the topics on the board, like: birthday, sibling births, getting a pet, losing a pet, divorces, broken bones, lost teeth, first sports games, recitals, ceremonies, moves, deaths, vacations, etc. Then have students make a timeline for their character, using the list as inspiration of possible events. Ask students if they ever had an imaginary friend. Tell them they are going to pretend their character is visiting for the day. The characters will have pretend chairs and will sit next to their students in class, walk next to them in the hallways, play with them at recess, eat with them at lunch, you name it. Just surrounding students with their characters will help students think more about them, get a feel for their reactions and moods. If they latch on to the idea, try having students keep an observation log of their characters' imaginary behaviors. You may remember giving this task to students at the beginning of the year, where you give each student a brown paper sack to take home and fill with objects (photos, mementos, awards, etc.) that remind them of special memories. Then each student shares their items and the class gets to know each other better. Try doing the same activity, but where students fill the bag for their character. They might borrow some of their own chachkies but change the memories that are attached to them. They might cut out pictures from magazines or even draw a few. What is a secret you've never told anyone? What do you hope to do with your life? What is the biggest obstacle of doing this? What do you feel most guilty about? If you could re-live one day, which day would it be? If you could change one day, which day would it be? What would you say to a room full of people your age? You know the game, especially if you have children. It goes something like this: your child asks you a question; you answer the question; your child asks the follow-up question: why? ; you try to explain; your child follows up again with: why? ; and it goes on until you yell: because I said so! The Why? Game can get students to drill way down into a character's background, forcing students to think about the motivations and reasons a character might have for doing certain things. 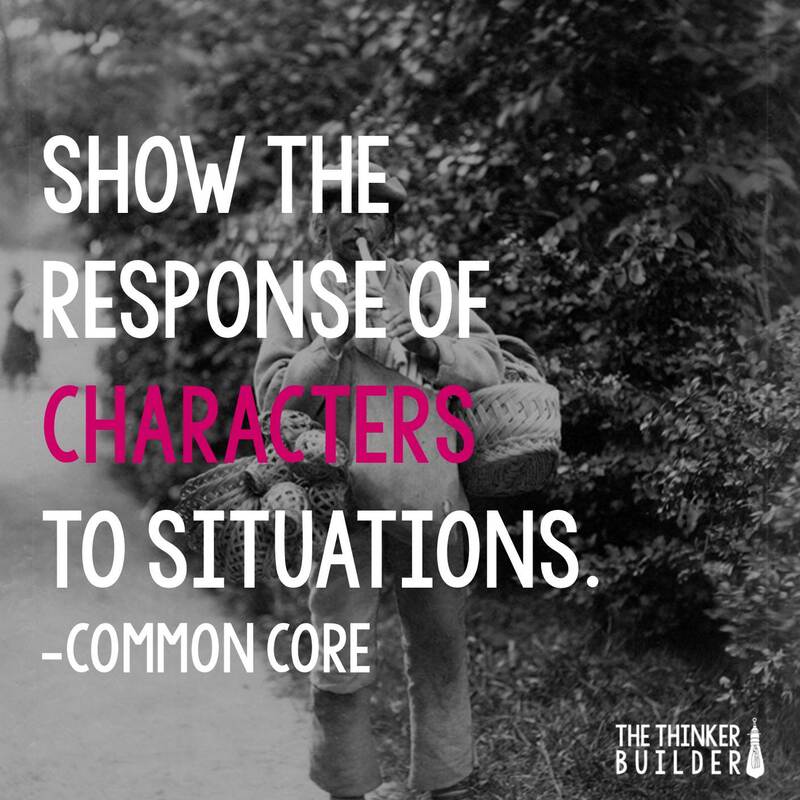 Start with a simple, very general, action that all students' characters will hypothetically perform, and then ask, "Why?" Give students time to write a reason, then tell them to ask, "Why?" to what they just wrote, recording the next answer like a flow chart, until they track as far back as they can go. This is a good activity for students to do with a partner, to help prompt each other with the appropriate "Why?" question (e.g. "Why did he do that?" vs. "Why would it happen that way?" vs. "Why would he say it so rudely? "...adjusting the phrasing can spark more responses). Here's an example you could use with students, modeling three separate characters so that students start to see how different the responses can be. Starting Action: "Your character throws a rock. Why?" Your character laughs out loud. Why? Your character throws up. Why? Your character takes a walk alone. Why? 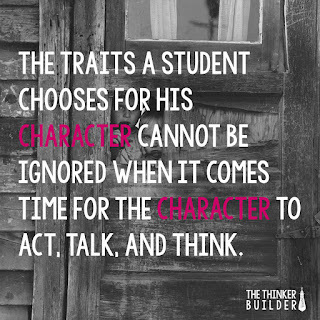 Your character skips school. Why? Your character picks a flower. Why? Your character dresses in nice clothes. Why? An idea that combines elements from several of the exercises above is to create a scrapbook. The student completes the scrapbook as if she is the character. The scrapbook you see in the photographs below comes from my writing center, Character Scrapbooks, which is one of my of Keep It Fresh! Writing Centers. 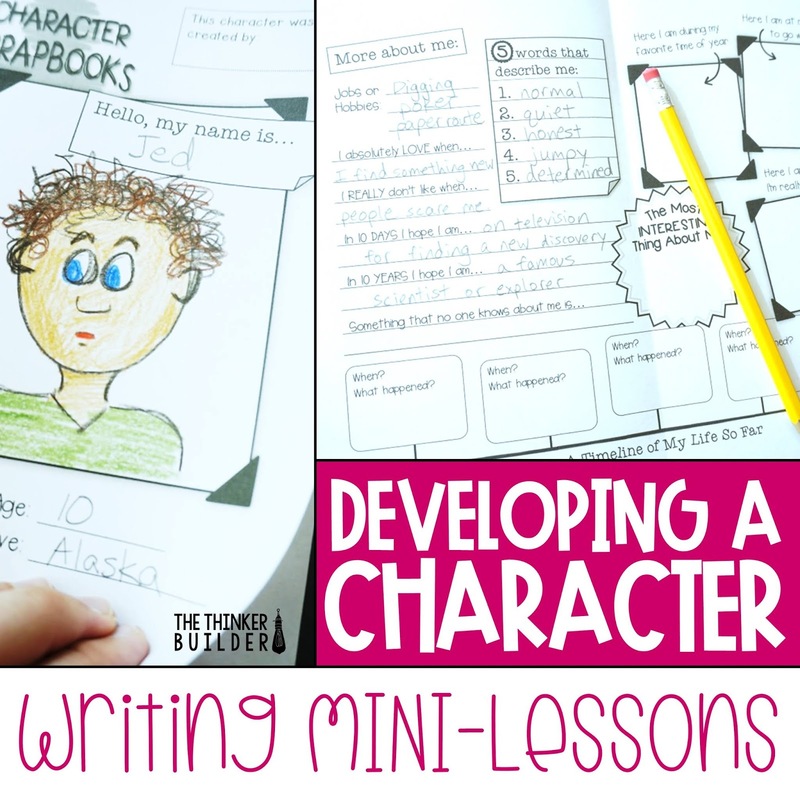 When I used this center with my third graders, they loved creating new characters. I had them keep their finished scrapbooks in their writing folders so they could refer to them whenever they needed a new character for a story or to even inspire an idea for a story. If you are interested in learning more about this resource, click HERE for details. I'm not suggesting to have students complete all of these activities every time they want or need to write a story. But what will start happening is the thinking students put into these sort of activities will naturally carry over into future characters and stories. Of course, students may want to reuse the same character a few times, especially if a lot of work went into developing one. No problem here! But even when they are creating a new character, or even supporting characters, the depth they put into their previous characters will surely not be totally forgotten.